The Gentle Bull, Not The Vicious One, Kills His "Keeper"
This photograph was taken at an Amish farm in Pennsylvania. 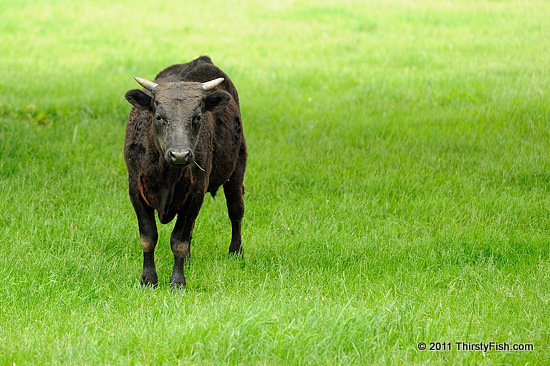 A Bull is an intact (non-castrated) adult male cattle. Bulls can be very aggressive and are responsible for significant number of livestock related fatalities across the world. An article in the Mar. 12, 1927 issue of the popular farming magazine, The Farmer states: "Handle [the bull] with a staff and take no chances. The gentle bull, not the vicious one, most often kills or maims his keeper". One definition of Keeper is "a person who assumes responsibility for another's behavior". In the Biblical story of Cain and Abel, the two sons of Adam and Eve, Cain becomes jealous of his brother Adel who he perceives as favored by God, and kills him. When God asks "Where is your brother?" he answers, "Am I my brother's keeper?" stating his reluctance to accept responsibility for the welfare of his brother. In the story, Cain is sentenced to restlessly wander in the Land of Nod which is located in the East of Eden. Philosophy buffs, esp. deontologists and consequentialists, argue back and forth about whether it is the act, or the outcome that matters. Looks like God has spoken against fratricide, but on the other hand, fratricide may have prevented civil wars? And how about the problem of the Gentle Bull?